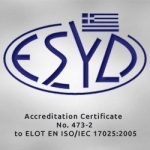 the Laboratory Calibration available to the company obtains accreditation from National Accreditation System (ESYD SA) for providing calibration services, offering reliability and validity to your weighing equipment. In privately owned facilities of ALEXIOU S.A. company, located in the Industrial Area of Mandra, carry the whole production process from design, planning construction and maintenance of weighing machines, spare parts and pilot plants. Featuring Production Department and Department of Electronic Laboratory manufacture both mechanical and electronic parts of weighing machines offer. Also Mass Calibration Laboratory offers a full package of coverage regarding calibration standards weights and weighing machines. This gives us great satisfaction as the only possible exception in the Greek market. In 1997, certified for the first time under the standard ISO 9001, ensuring the same quality for all products manufactured and certified in 2009 under the revised standard now ISO9001: 2008, retaining full Electronic Quality Management System.